Americans have never needed to lose weight more than they do right now. According to brand new numbers that were just released by the National Center For Health Statistics, nearly 40 percent of all U.S. adults are now officially obese. That is an all-time record. And as you will see below, more than 70 percent of us are officially overweight. Of course most of the population does not even understand what is being done to them. The elite that own our major food corporations know that eating heavily processed foods is a highway to heart disease, cancer, diabetes and other deadly diseases, but they keep pushing those foods on us anyway. The average American diet is extremely self-destructive, and it is time for a change. The United States will not be escaping the obesity epidemic crisis anytime soon: Nearly 40% of adults and 19% of youth are obese, the highest rate the country has ever seen in all adults, according to research released Friday by the National Center for Health Statistics. Since 1999, there has been a staggering rise in the prevalence of obesity, particularly in adults, without any “signs of it slowing down,” according to the study’s lead researcher, Dr. Craig Hales, medical epidemiologist at the US Centers for Disease Control and Prevention. 1999 was not that long ago. 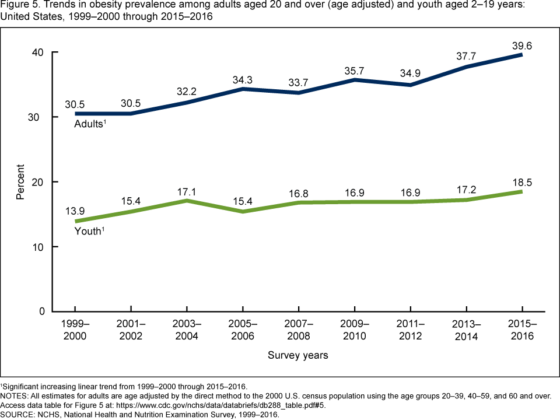 What is “very striking” about this information is that there has been a 30% increase in adult obesity and 33% increase in youth obesity from 1999-2000 data to 2015-16, despite government-focused efforts to address the issue, according to Michael W. Long, assistant professor at the Milken Institute of School Public Health at George Washington University. So how do you know if you are obese? It doesn’t take a rocket scientist to figure out why this is happening. As the world economy has become globalized, the major food manufacturers are getting their garbage into the hands of more and more people. Today, billions of people all over the planet are eating nutritionally-empty foods that are packed with all sorts of ingredients that humans simply should not be eating. That means that less than 30 percent of the population is at a healthy weight right now. Going “on a diet” is not the answer. Any short-term changes that you make are ultimately going to be futile if you don’t make long-term changes to your eating patterns. -Get as much sugar and high fructose corn syrup out of your diet as possible. A great place to start is by getting rid of sodas and other sugary drinks. My wife and I will have a soda when we go out to eat as a treat, but we don’t have any in our refrigerator at home. -Try to start eliminating heavily processed foods from your diet. This can be very difficult to do, because most of us have become quite accustomed to eating what the large food manufacturers offer us. -Start shopping in the organic section of your local supermarket if you can afford to do so. Organic food manufacturers often offer similar versions of what the large food manufacturers make, but the ingredients are far superior. -Incorporate as much fresh produce into your diet as possible. As humans, we are supposed to be eating a plant-based diet, but most of us have gotten very far away from that ideal. -Make exercise a regular part of your daily life. A sedentary lifestyle kills, and those that live active lifestyles often find that they can stay active well into their golden years. As long as we keep eating what they offer us, the major food manufacturers are going to keep doing what they have always done. So it is up to us to make the changes that are necessary, and this is a battle that we simply cannot afford to lose.